Good morning! Welcome to Mail-friendly Monday where you'll find cards that pop in the post with a standard postage stamp. The most important thing to remember about these cards is that anything knobbly (brads, adhesive gems, ribbon in knots and bows etc) will tip it over into the next postage bracket. But that doesn't mean it has to be plain and unembellished! 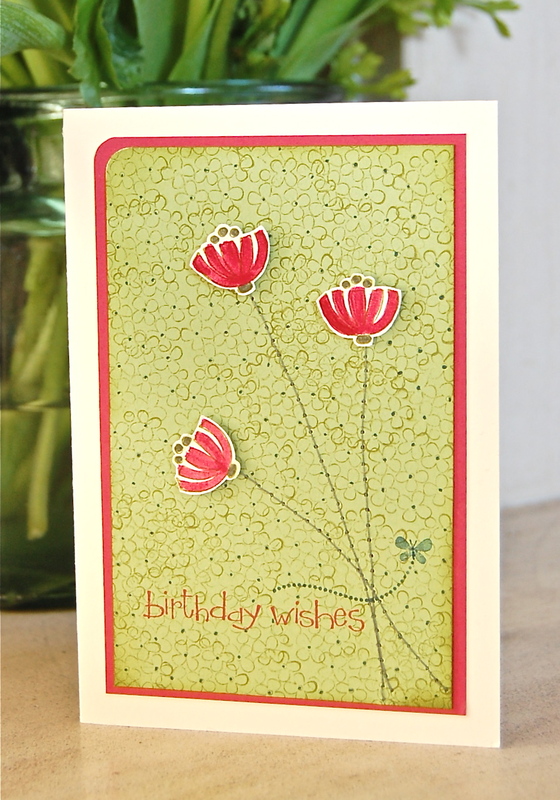 Today I want to show you a birthday card I made using the Sweet Summer Sale-a-bration stamp set. This is a set of nine incredible stamps which costs... NOTHING!!! Click here to find out how to get your hands on these gorgeous sets! Are you wondering what designer paper I've used here? 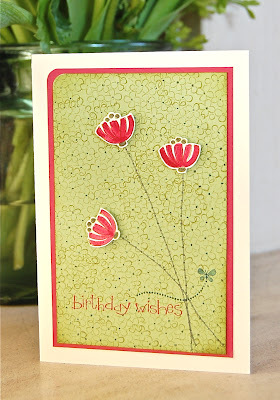 It's not a DP of course, it's just Certainly Celery card stock that's been stamped all over with the mop-head flower stamp from Sweet Summer, using Old Olive ink. I added flower centres with the fine end of a Not Quite Navy marker, which might seem like a very time-consuming and mad thing to do but which actually turned out to be pretty quick. Sometimes I think of things and just can't rest until I know what it looks like! These unusual flower heads fascinate me! I made stalks for them with my sewing machine, threaded up with an Always Artichoke-coloured cotton. Sewing is a great way of adding non-bulky detail to your cards. The sentiment is from another free Sale-a-bration set called So Happy For You. You get ten stamps in the set, five of which are really useful sentiment stamps - and we all need more of those! I love the little butterfly too, lovely for adding a bit of extra detail. I shall be taking a look at how to get the most out of this set this week, so look out for that. Cut a piece of Certainly Celery card stock 8cm x 12.75cm and curve the top, left-hand corner with a corner rounder. Stamp the mophead flower image repeatedly over the card stock using Old Olive ink. Add centres to the flowers with the fine end of a Not Quite Navy marker. Sponge the edges of the card stock using Old Olive ink and a sponge dauber. Stamp the sentiment in Rose Red ink, using a stamp-a-majig for accuracy. Sew three stalks using a sewing machine threaded with green cotton. Pull the ends of the cotton through to the back of the card stock and secure with double sided tape. Stamp the butterfly above the sentiment and over the top of the sewn stalks. Stamp the other flower head three times using Old Olive ink on Very Vanilla card stock. Colour the petals with a Rose Red marker and the seeds and base of the flower head with an Always Artichoke marker. Cut the flowers heads out with sharp paper snips and attach to the tops of the stalks with dimensionals. Mount the panel onto a piece of Rose Red card stock cut to 8.5cm x 13.25cm and with the corner rounded. Attach this to the front of a Very Vanilla A5 card base. All these supplies come to a total of £48.90 which means that you get to choose your free stamp set! It's easy to order from me - just click here to email me, or phone me on 01280 820593. I pride myself on my customer service and am always happy to help. I hope you all had a great weekend. I've had a wonderful (and rare!) restful weekend with my family, with plenty of fun and crafting and even time to curl up with a book! Lovely! Gorgeous card Vicky. Love how you've created your own background and the extra detail you've added with your stitched stalks! What a beautiful card, I love the background !! I love your "designer paper." And stitching the stems is a great idea. Wow, way to create your own patterned paper! It's one of my favourite things to do, too. The red flowers really pop and I love the long, stitched stems! I really like the hydrangea style flower as the background. So clever, the way you created your background paper. And using the marker for flower centers was the perfect touch. Fantastic card, as usual, Vicky!